Over recent years Jim Carrey's philanthropic and charitable activities have become higher profile, headlined primarily by his own 'Better U Foundation'. No newcomer to charitable work though, Jim's been involved in assorted activities from the early days of his career. One such charity is 'Comic Relief' a UK based charity started up in 1985 to raise money for the starving in Africa, and provide help at home and to those in disaster zones. Bob Zmuda then brought the event to the USA in 1986 where it has become an irregularly held event, televised on HBO, raising $50 million toward providing health care services to homeless people throughout the United States. Since then Jim has regularly participated in various events organised by the charity and you can see a clip from the 1992 fundraiser featuring Jim, who in his own unique way, managed to bring humour to the painful subjects of poverty and homelessness and shared a method of winding up traffic police. No disrespect but why was this posted? Is he performing this year? 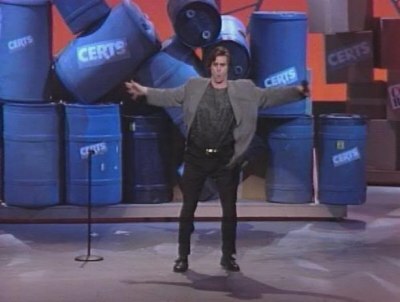 We have never written about his work for 'Comic Relief' on Jim Carrey Online in the past. We want to bring more focus on some of the charity foundations he has supported. It will be a new Area here on Jim Carrey Online, that I think deserves more attention. We will add pictures and videos of the stuff if it is available. I think being anonymous is good too. Whatever he feels comfortable doing.